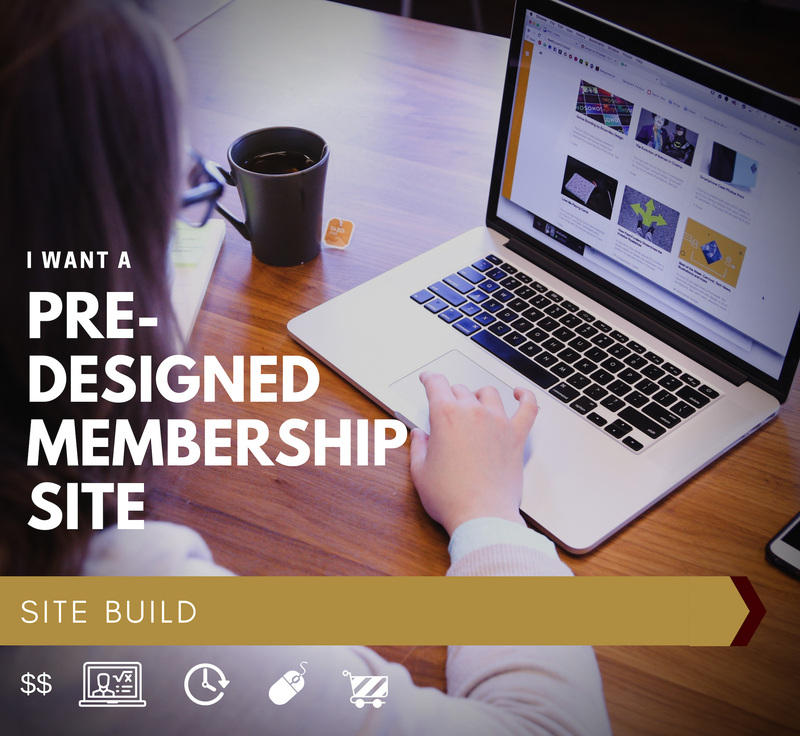 We have designed membership layouts to provide you with stunning designs you can be so proud of without having to spend 5-figures to get started. After choosing your design from our list, we will match all the colors, logos and fonts with your own branding and styling. We will integrate your own AccessAlly on the site and all you have to do is enter all your content in. You will have templates for these common pages so that you can add as many of those as you want now and in the future and you won't be limited. This does not include your public site hosting nor design - you have to host and build that separately. This is for Membership Site ONLY. Front page will be the LOGIN PAGE. This does not include your course contents or the placement of your content. We will provide you with step-by-step tutorial on how to add your content, videos, etc in. This does not include Web Hosting. Please sign up for hosting with companies like Bluehost, Dreamhost, WPEngine and you will provide us with your logins so we can build your site there. For your security, this does not include setup of your payment gateway (Stripe or Paypal). We will provide you with step-by-step tutorial on how to set it up and integrate with your site. This does not include the cost for all your other platforms including CRM (Infusionsoft, Ontraport, Active Campaign, ConvertKit, Drip or Keap) and AccessAlly license. This does not include technical support for your launch other than the tutorials. Apply now by clicking here. If we're a good fit, you'll proceed to Step 2. You will receive an email confirmation with link to the form you need to fill out. That form will inform us with your chosen design, your style and all other essentials we need from you to get your site started. As soon as we received your submitted form, we will start building your site. Normally, we get it done within 14 business days from the day you have submitted. We will notify you when your site is ready. Next step is for you upload your course content and materials to your site. Once you're ready with your content, products and sign up pages, you can now launch it out to the world! Simple and minimal layout that provides feminine, easy and light design! Quick and easy to follow site flow with minimalistic layout for those who needs to go in and out quick! Get a chance to replicate our site! Sophisticated pattern with bold colors! Easy to navigate designed for users and admins with colors that are perfect for health experts! Will surprise you with bold graphics that are at the same time chic! Gold is key here! Designed to make users feel relaxed and more into their spiritual world. Easy to navigate and follow through. Fun design but is very clean in layout and straight to point. Flows well both for users and admins. An open concept theme for those who likes minimal look. "As a business owner I know just how hard it is to find the right partners for my projects. When I started searching for who I could hire to help me with the daunting task of moving all my online courses to a new customized membership website, all I knew was that I needed to find and hire THE BEST. My priorities for this project were quality, speed, a seamless switchover for my students and members inside my courses and a team who was available to walk my team and myself through the learning curve of the new website and platform. I had my initial consult with Charm, and was confident I had found the right team. As soon as I said “Im in”, we went full steam ahead. It was the most organized, efficient, accommodating process. Often I found myself making comments to my team about how awesome the SophisTECHated team is to work with. Anyone who has hired partners and freelancers before already knows that often big shiny promises can lead to empty, frustrating, and costly results. Not here. Not with Charm and her team. They straight up deliver. Scratch that…they OVER deliver! They provide quality work and (get this) they CARE. Thank You Charm and your amazing team! I look forward to a long ongoing partnership with you (you’re not getting rid of me ever)"
"Wanna give a shout out to SophisTECHated Marketing & Developments Team for being complete rockstars through tech issues and setting up GORGEOUS dashboard for my products and membership sites. I highly recommend them! ♥ "
Does this include the design/template for my public website? No, this is only for your Membership Site. The front/home page of this site will be your login screen. You'll need to design and host your public site separately. Do I need to a tag-based CRM for this? Yes! This is one of the requirements for your membership site. If you haven't signed up yet you can choose from Infusionsoft, Ontraport, Active Campaign, ConvertKit, Drip or Keap. Do I also need to buy a shopping cart plugin so I can take payments via my membership site? Nope! You don't have to! This is the beauty of AccessAlly - the membership plugin we use inside your Membership Site. It has a built-in payment system that you can use and integrate with Stripe and Paypal. You're covered! Can I have a forum inside my Membership Site In A Box? Yes! We recommend and have a tutorial on bbPress inside the site. This is also what is included in our support. You are also welcome to add the forum platform of your choice. Can I cancel and get a my money back? You have 3 days from the day you made a payment to change your mind and cancel. Anytime after 3 days, we would've started with your site already and can no longer offer refunds. Will you be hosting my membership site? You will need to purchase hosting. We will build your site on your very own hosting. What other tools and requirements do I need other than choosing from your designs? All you need to have is your own CRM (Infusionsoft, Ontraport, Active Campaign, Drip or ConvertKit), your domain, hosting and AccessAlly License. Once signed up, you will get a checklist from us to guide you on what you'll need. Can I have more than 1 Course or program inside my Membership Site? Definitely! You can have as many courses. You'll be able to create a dashboard where all your program icons will reside. From there your members or students can pick which program they want to access. We'd love to hear from you! You can also chat with us via the chat box at the bottom right corner of this page or you email us at info@sophistechatedmarketingdev.com. "My miraculous Gamification Expert, Charm Fernandez and her amazing team! The membership site exceeds alllll of my big expectations and entails features I've never seen anywhere else before... it's truuuly the Hogwarts for female entrepreneurs and I'm HEAD OVER HEELS IN LOVE!" 2018 © SophisTECHated Marketing & Developments Co.